Check it out, share it with your friends, tweet it, post it, pin it, reddit, live it, love it! Chic’s ultimate digital music compilation ‘The Studio Album Collection 1977 – 1992’ is out NOW! Featuring all eight studio albums from the iconic disco band – everything from their groundbreaking 1977 debut ‘CHIC’ to the ‘90s sensation ‘CHIC-ism’ – this collection is the essential soundtrack to make you ‘Dance, Dance, Dance’! Nile Rodgers attends an event to benefit his We Are Family Foundation in New York City. "Been hearing a lot about reddit and decided to come in and have a chat," Nile Rodgers breezily explained in his opening note to yesterday's Ask Me Anything session. The dance music pioneer, whose star has been on the rise once again thanks in part to his prominent role on Daft Punk's Random Access Memories and collaborations with other EDM artists like David Guetta and Avicii, took a moment out from touring in Japan on Saturday to answer fan questions about his time with Chic, guitar technique, future collaboration plans and more. Below, we've collected a few of the highlights. How do you feel about getting recognized more and more these days following the Daft Punk collaboration? It's really weird to be in the spotlight so much, but Daft Punk, like Chic, are semi-anonymous and they asked me to do most of the press. Of course I love the guys and wanted the record to be heard, so I took one for the team. Guitar maestro, producer extraordinaire, hippest man on the planet: Nile Rodgers is all of these things and more. The Nile Rodgers story goes back to 1976 when he formed The CHIC Organization with Bernard Edwards. Since that time he has become a one man hit factory. From working with and co-fronting CHIC to branching out with Sister Sledge, Sheila & B Devotion and Diana Ross, Nile Rodgers has sprinkled his magic on musicians from many generations coming right up to date with Daft Punk. October the 28th sees a special edition of the top 3 album Up All Night: The Greatest Hits. This special Disco Edition coincides with some massive TV shows which include BBC Breakfast and The X-Factor UK on which CHIC will perform a medley of three of their biggest hits. The original edition of the album charted at number 2 and has remained in the charts since its release in June. This new DISCO EDITION features not only the biggest early hits such as 'Le Freak', 'Good Times', 'Upside Down' and 'He's The Greatest Dancer' but later number one singles, Duran Duran's 'The Reflex', Sister Sledge's 'Frankie' and MADONNA'S 'LIKE A VIRGIN'. 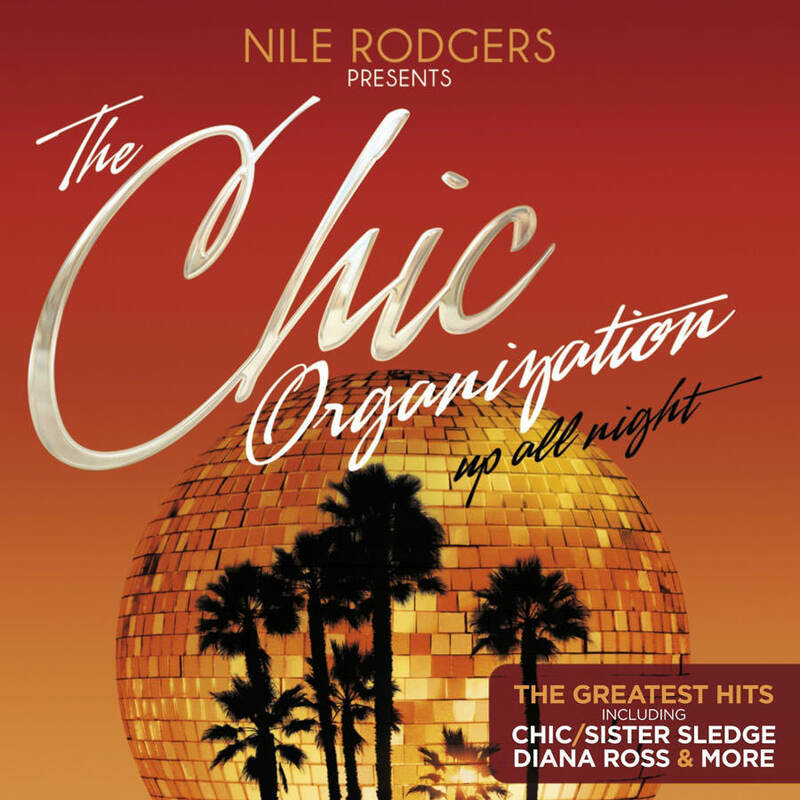 In additional to these new tracks the album includes an amazing 'CHIC Minimix' which features 12 of their biggest tracks mixed together for 7 minutes of aural heaven. The new version of the album is completed with an exclusive inclusion of some of CHIC's memorable performances at this year's GLASTONBURY FESTIVAL. Rodgers may not have performed on the biggest stage at the festival but he certainly turned in the biggest performance with the set that everyone was talking about. The Glastonbury Glastonbury 'Medley' features tracks that Nile produced including 'Lady' (which sampled CHIC classic 'Soup For One'), 'Like a Virgin', DAVID BOWIE'S 'LET'S DANCE', 'Rapper's Delight' and 'Good Times'. Since Glastonbury, CHIC have been wowing audiences at festivals across the country with 5 star performances. In addition to playing live, Nile has been hard at work collaborating with the likes of Disclosure, David Guetta and Avicii. The dance music world just can’t get enough of Nile Rodgers. And for good reason: the guy has remained constantly relevant since the ’70s, and is riding a tidal wave of attention in the last couple years with his collaborations with Daft Punk, Avicii, Nicky Romero, and more. Dubspot had a chance to sit down with the legendary guitarist recently to roll through a number of his past achievements and get inside the mind that created some of dance music’s biggest hits, among them Madonna’s “Like a Virgin,” David Bowie’s “Let’s Dance,” and his own band Chic’s “Le Freak,” to name just a fraction. But Rodgers wasn’t always a hit-maker; it took being put in his place by a former music teacher to really embrace the dance and pop worlds. See how it all went down in the 10-minute documentary below. In the history of pop second winds, Nile Rodgers may be setting a record. From the mid Seventies through the late Eighties, Rodgers' footprint was all over the charts. First, he was the co-founder of the iconic disco band Chic, the man who co-wrote and played guitar on "Le Freak," "Good Times," and Sister Sledge's "We Are Family." Although Chic disbanded in 1983, Rodgers went on to become one of pop's most ubiquitous producers, helming records by David Bowie (Let's Dance), Madonna (Like a Virgin), and Duran Duran (Notorious) and hits by the Thompson Twins, the B-52s and many more. Drug addiction curtailed Rodgers' life and career in the Nineties, but he's blasted back as EDM's most beloved founding father: in the last year and a half alone, he's worked with Daft Punk ("Get Lucky," "Lose Yourself to Dance") and Avicii ("Lay Me Down") along with David Guetta, Disclosure and other dance producers. Talking with Rolling Stone in his Manhattan apartment, Rodgers clicked through some of the legends and newcomers he's worked with and some of his favorite tales about them.